Here is the final (I think) version of the donkeys and the crows. It's 6.5" x 16"... an experiment that kept evolving. This is a detail of (last month's) blue moon. It is made of leftover fringe scraps that I compressed and then sewed in with silvery thread. Now I am wondering what the donkeys and crows are saying to one another, so I will address that soon. Meanwhile I'm hoping to make a header for this blog, but no promises as to when it may appear, that is to say, how long it takes to figure out how to do it. Here's a close-up on how the donkeys are coming along. I gave them a little ground to stand on. And here is another bookmark. I used linen for the background. This little bird I made using a stabilizing fabric backer because it's silk and was slippy sliding around something terrific. Next time I'm going to experiment with starch and see if that will help with tucked-under applique. Maybe it would be a good idea to work on a bigger scale! The photo doesn't pick up the shiny thread moon that the winter bird is looking at. And here is one more, an experiment, a sampler of all these new (to me) ways of working. It is maybe Santa wading through the January lull. This is a work in progress. The farm I love to visit has donkeys. One day during Christmas I stepped outside thinking I heard the donkeys braying, but it was a big flock of crows. They both have nice raspy voices, and it was the time of the blue moon, so I've been thinking about all that. Then today, because of a post on spiritcloth.typepad.com (January Thaw) I realized there are 2 ancient dresses far back in the closet that I believe were my grandmother's. We called her Ninawr. They are stained and not really wearable so perhaps I will put them to use as elements to enhance these cloth pictures, as I used fragments of her shawl in the frog bookmark. Here is what they look like right now. I am showing them like this because I don't want to think of them as dresses or it will be too hard to borrow from them. Yesterday I made this little frog. It took 2 days, because the first day was spent trying to come up with a good plan. Today I put on the backing and will mail it to my aunt who has always made hand-made gifts for us all. I wrapped a little bit of my grandmother's shawl around the top and bottom. This is a small wall hanging from 2 years ago called "Earnest and the Peony". I printed it onto silk from a photo and then embroidered etc. Earnest was given to me by my neighbors who moved away. He has a son named Edgar who has to be in a separate aviary because they fight horribly if housed together. Yet they sit on neighboring perches and serenade each other all day long. Today I worked on this small square. It is the second of four. Also, I raked up some leaves and piled them, along with some pomegranate skins, on top of some silk and part of an old shirt, in the hopes that it will turn an interesting color if it stays there long enough. Topping it off are some apple branches sprinkled with water in case it doesn't rain any more today like it is supposed to. It's an experiment. I love reading the postings about snow back east and elsewhere. We have no snow here, but...this is Earnest. He is not snow, but he is as white as snow. This is what I did yesterday in the midst of work being done on the house and the Christmas tree going bye bye, because it was Twelfth Night. This bit of embroidery is still homage to the blue moon, waning now. I wish I had used a contrasting thread, but this is as it is now, allowing for change as the piece grows larger. I am grateful to Jude Hill at Spirit Cloth for teaching about this wonderful stitch and for celebrating slowness. Welcome to my blog. A first step out of the silence of my studio and into the webwork of like-minded others. Hello. This is "Peace Crusader". 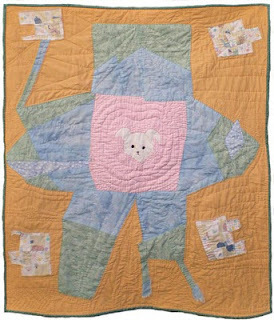 It is a small quilt with my dog Agnes at the center.